Atrium at the Ford Foundation Building. Photo: Wikimedia Commons, Kenlarry. And so, the Municipal Art Society appreciates the purpose-built intention of this space, and the effort to further the Ford Foundation’s mission through the proposal at hand. The most significant intervention, and the most troubling for our Preservation Committee, is the wheelchair lift. First, the new walkway along the southern façade alters the relationship of the atrium softscape to the 42nd Street exterior. The lift itself has an enormous impact, though the material selection of cor-ten steel and clear glass seeks to minimize the intrusion. The slope of the granite retaining wall is a great improvement over the previous scheme presented to our Committee on April 1st. Similarly, the ramping of the northern path to expand the wheelchair accessible area is a positive move, though the stepped scheme of the garden, an important characteristic, is compromised. We are also concerned about the removal of the planter at the 42nd Street entrance. This feature does not inhibit passage, and therefore its elimination seems an unnecessary interference with the landmark design. Likewise, it has been argued that all the existing and new entrances must accommodate a single 36-inch door with a 32-inch fixed sidelight, in order to reduce the number of stanchions required for automation of those doors. Again, this would appear to be avoidable, as the existing double doors can be automated or replaced in kind, and operated by a single stanchion. The fixed sidelight interrupts the rhythm of the curtain wall façade, and is not needed to achieve accessibility. 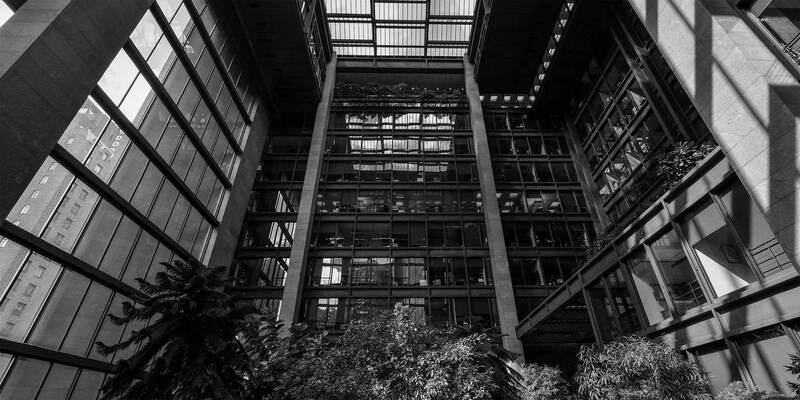 In sum, we very much appreciate the worthy charge of the Ford Foundation and its built expression in the atrium, this “public gesture.” We ask that the Landmarks Preservation Commission guide the project team toward achieving the important goal of accessibility, while persisting in the excellent stewardship of this extraordinary landmark.